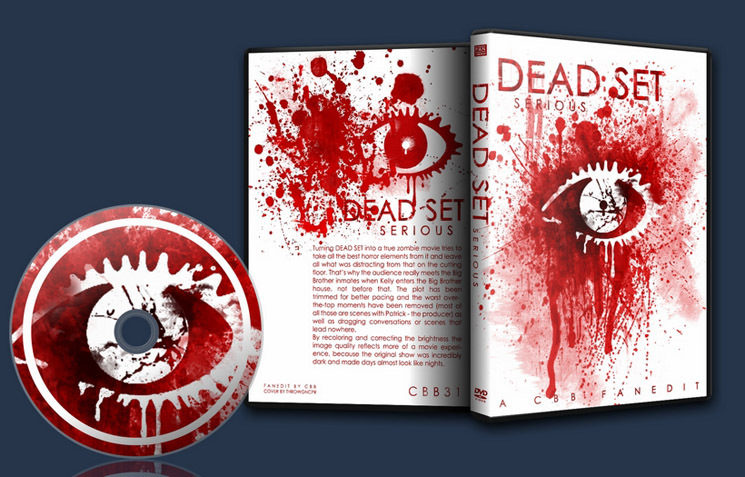 Dead Set was an incredibly great TV show and the most shocking one for a long time. 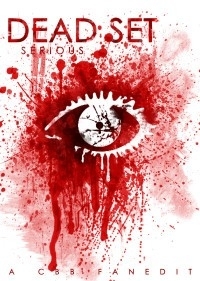 Responses all over the globe were praising it and rightfully so, because it was from the plot over the cast to the filming and the special effects a really well crafted horror show, combining elements of Big Brother and a Zombie outbreak. And there you already get it, because that sounds ridiculous and funny. On the one hand the audience gets the dragging scenes and talks from the Big Brother inmates and on the other hand the horror from running, killing and flesh eating zombies. In addition to that some scenes are incredibly over the top (Patrick shitting in the bucket, hacking Grayson, being eaten, etc) or stupid in wanting to be funny (the light machine, the policemen, Marky shooting at Riq, etc). That’s where I wanted to get in. This show had so much potential for a cool fanedit movie that I just could not let it pass and I think the outcome is among the best zombie movies of the entire genre. EDITING DIARY: 1. Ripped the DVD with AnyDVD, extracted the movie with pgcdemux, converted the ac-3 to wav with headac3he, multiplexed audio and video with tmpgxrpess, created beginning credits in pro show producer, created sound for beginning credits with adobe audition, edited the movie in womble including all sound and video transitions, created end credits in pro show producer, created sound for end credits with adobe audition, encoded. result: video errors, audio out of sync. 2. tried with Ulead Media Studio Pro using the multiplexed video files. Result: fancy colors wherever I wanted to make a cut. 3. converted the video files with virtualdub to Lagarith Lossless avi, worked from there with Ulead Media Studio Pro 8. Result: video errors (several heavily pixelated scenes). 4. Read the DVD back and found out that they used Ripguard for copy protection. 5. Ripped the DVD with DVD Fab Decrypter, still no perfect result, but the best one of them all. Converted the video with virtualdub to lagarith lossless avi, corrected the tiny sync problems with adobe audition, muxed audio and video with virtualdub. Edited the video with Ulead Media Studio Pro 8, encoded to Lagarith Lossless avi, converted with virtualdub frame server + CCE (Cinema Craft Encoder) including multiple color and resize filers to mpg, used dgpulldown to correct the framerate to 29.97, created audio with Ulead, used Sony Vegas to turn pcm audio to 5.1 audio. Result: good. 6. Authored the DVD. TIME NEEDED: editing: 7 days, extras: 2 days, DVD menus: 1 day, quality checking and further corrections: 1 day, cover art: 1 day ADDITIONAL TECH COMMENT: On the tech level this fanedit gave me a hell ride. For the first in a long time I could not get a proper rip from the DVDs, thanks to Ripguard (yes, finally they really used it on an official DVD) copy protection and no ripper around to completely break it (DVD fab Decrypter gave the best result though). Womble gave me a lot of errors, every time I worked with it, Ulead gave me fancy colors wherever there was a cut, so I had to convert the movie to Lagarith lossless codec and resync the audio, to finally gain a version I could start editing with. Macrovision: you tried, but could not really stop me. The idea was simple, the creation not so much, most of all because of technical problems though. 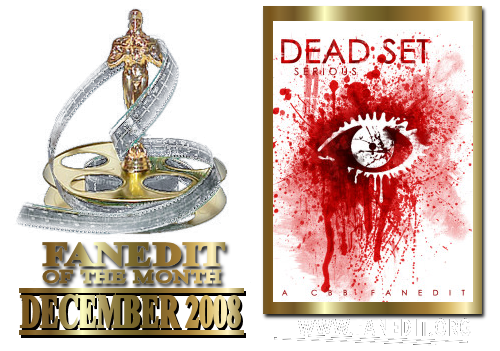 Turning DEAD SET into a true zombie movie tries to take all the best horror elements from it and leave all what was distracting from that on the cutting floor. That’s why the audience really meets the Big Brother inmates when Kelly enters the Big Brother house, not before that. The plot has been trimmed for better pacing and the worst over-the-top moments have been removed (most of all those are scenes with Patrick – the producer) as well as dragging conversations or scenes that lead nowhere. By recoloring and correcting the brightness the image quality reflects more of a movie experience, because the original show was incredibly dark and made days almost look like nights. I really loved the original as it was but I wanted to see this just out of curiosity. It’s an interesting curio very well edited (I didn’t notice any jump cuts or anything out of place). However I must confess I missed the jokes which actually made this production work for me so I will stick with the original set but thanks for doing it as it does provide an alternative take on the material (just one that wasn’t to my taste). I must confess it’s a bit bizarre to read so many people saying that haven’t seen or heard of the original version but saw your edit first (I do hope they did the right thing and got hold of the original). One of the best zombie movies I have ever seen. This was truly great entertainment. The zombie action starts just a few minutes into the movie and the next 90 minutes just flew by since it really sucked me in. I also thought that the reunion subplot was great as well. It’s not common to have a love story in the midst of a zombie movie.